Faye Dunaway and Warren Beatty, who starred as Bonnie and Clyde in the 1967 film, announced the wrong best picture winner at last year’s Oscars. The pair wrongly announced “La La Land” instead of “Moonlight” in one of the biggest mistakes in Oscars history. On Sunday, they will get a chance at redemption when they once again present the best picture Oscar. 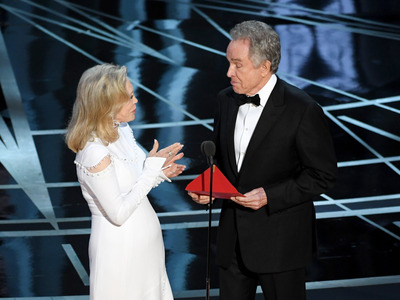 Faye Dunaway and Warren Beatty were involved in one of the biggest mistakes in Oscars history last year when they announced the wrong film as the best picture winner due to the wrong enveloped being given to them. But on Sunday, at the end of this year’s Oscars ceremony, it sounds like they will get a chance at redemption. Dunaway and Beatty will once again announce the Oscars top prize, according to TMZ. Glenn Weiss, the director of last year’s Oscars telecast, is also returning this year. He told Business Insider that last year he thought Beatty and Dunaway were just doing a comedic bit at first – until he was notified a minute and a half after the “La La Land” announcement that there was a mistake. Last year’s gaffe was mainly the mistake of PricewaterhouseCoopers, the accounting firm that the Oscars puts in charge of counting ballots and managing the envelopes. A PwC partner gave Dunaway and Beatty the wrong envelope after tweeting backstage. The envelope was a duplicate copy of the best actress envelope, which had revealed Emma Stone for “La La Land” as the winner moments before. With this envelope in hand, Dunaway and Beatty read “La La Land” as the night’s big winner rather than “Moonlight,” the actual winner. PwC will also be back for this year’s Oscars, but with some changes to hopefully ensure something like last year doesn’t happen again.